First, you tackle your own wardrobe. Because let's face it, the real reason you go on a vacation is to show off your vacation wardrobe. You lay everything out on the bed, hang off the closet doors and spread out all the coordinating accessories all over every flat surface of your bedroom. And you litter the floor with matching shoes. Then, since this isn't your first rodeo, you remove half because you never going to wear everything. Then you do the same thing for your spouse. You pack a lot of choices for the child, because you know there will be an ice cream meltdown somewhere during your vacation and he will need an immediate change of outfit. You start packing your suitcase. If you're flying – first you measure and check the FAA requirements to make sure that your suitcase is still legal, then you map out your attack to maximize every nook and cranny to pack as efficiently as possible. You make fat salami rolls with your clothes to minimize wrinkles and leave half your shoes at home because all these cute wedges unfortunately add weight and you're at maximum already. You use the largest suitcase allowed because you're going to check it and pay the fee anyway, just so you can board the plane like a normal human being and not a mule. The only thing you carry on is your child's suitcase because if the airline loses your luggage, you would be more than happy to buy whole new wardrobe on location, but your kid's bedtime toy and a favorite barracuda tee can not be replaced. If you're driving – you're so excited about not having to measure out your "can't live without" liquids into a 3 oz containers (have these FAA regulators ever met a woman? We don't do 3 oz containers of anything, we need at least 30!) that you pack a full and heavy bag just of lotions and potions. You pack twice as much sunscreen as last time, because you remember you ran out half way through your vacation. 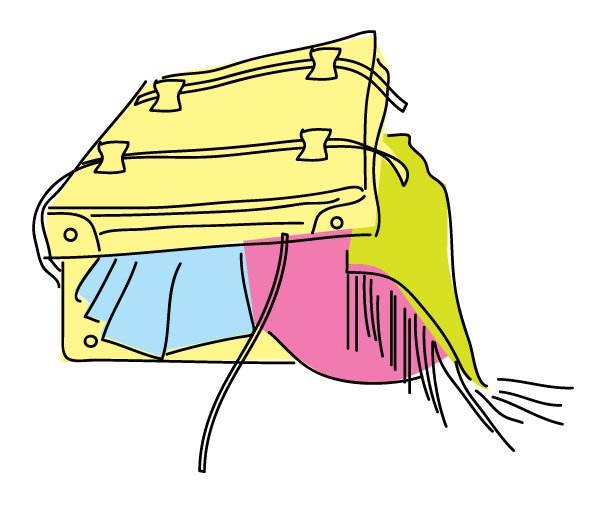 You pack a separate "overnight stop" suitcase, because that's what all the travel blogs said. Also per blog and Pinterest suggestion, you pack a large healthy picnic and a bag with paper towels, toilet paper, wipes and hand sanitizer. Then you discover that your rental car can't hold everything; the hotels no longer have mini-fridges to store your picnic leftovers overnight; the rest stops are super clean, air conditioned and truck stops even have showers; healthy picnics add time to your travel, a lot; and you have to lug all your luggage into your room anyway for fear of someone breaking into your car overnight and emptying it out. So much for "overnight" suitcase! Half way through your vacation, you realize that you're out of sunscreen again and have to buy it locally at three times the price for half the volume. Your spouse favors the same pair of shorts, and you discover that you can wear bikini and cover-up to just about anything which is what you end up doing because it's too damn hot to wear anything else. Your high heel fancy shoes never left your suitcase because you live in flipflops, and your kid never touched the enormous amount of beach toys you brought because he spent all waking hours in the ocean trying to catch fish with his bare hands. You lug everything back home, now full of sand and damp with sea water, and write a note listing everything you wore and didn't so next time around you pack only what you actually will use. The note gets lost two weeks later.